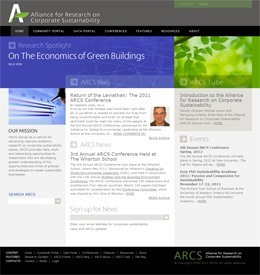 Alliance for Research on Corporate Sustainability :: International Portfolio :: PRO IT Service S.R.L. - Choose a professional and accessible service for your online image! 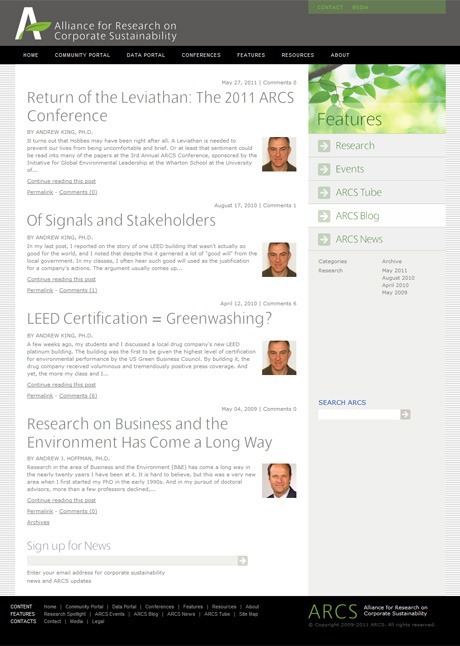 Logic Arts wanted to build a website for an association of institutions whose focus is "research on corporate sustainability". Chuck Green from Logic Arts asked me to code a complex website for the "Alliance for Research on Corporate Sustainability", which is actually an association of institutions focused on "corporate sustainability". Logic Arts contracted had the interface design prepared with somebody else, but hired me to convert it in web page format and then to integrate it within movable type. Or in other words, converting the interface design from graphical format to web page format, was the first assignment that I've got from Chuck. The job was a bit tricky, because it involved using a special font on titles and that needed the use of a technology called SiFR (acronym of Scalable Inman Flash Replacement). Another small challenge was on the sidebar, where my client wanted to use different colors depending on the section of the site where the user gets. I had to code this in such a way, which to be easily manageable once the content management system would have been implemented. The work I've produced was validated against the W3C (World Wide Web Consortium) standards and was cross platform compatible, in other words was seen the same on a broad range of popular web browsers. With the templates converted to web page format, I've got ready for the second and last assignment on this project, integrating the look and feel within movable type. And a forth section for News Articles. This structure was necessary in order to be able to operate the site as described in the templates, meaning with a specific layout for each section, and with a specific theme on the sidebar not only for each section, but even on different categories of the same section. Another nice, small but tricky feature, was to mark on the top drop-down navigation, as well as the sidebar navigation the page the user is currently visiting. Visitors are able to post comments, to reply to other users' comments, to subscribe to news as well as to search on the site. Over time we've upgraded the movable type publishing platform to the latest release, in an attempt to keep the installation well performing and secure. Almost two years after I've delivered this project, Chuck came back to me with another job, which consisted in creating a section for Conferences, and setting up an initial conference called "Third Annual ARCS Conference". Implementing this additional job involved in one hand slicing again the interface design in web page format, and then bringing it to the movable type platform. Contact, a PHP contact script which was later replaced by contact details in HTML version. Soon after the event passed, we've taken down the Registration and the Travel pages. You could go ahead and view the project at http://www.corporate-sustainability.org/. You could also see some screenshots further below. Subcontracting from Logic Arts, Glen Allen, Virginia, U.S.A.